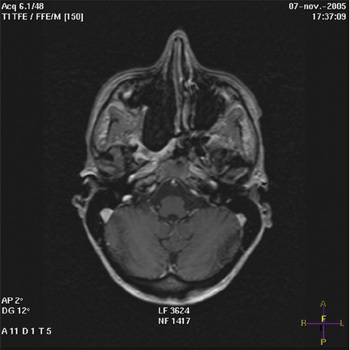 Case Report: A 33 year-old woman presented with a history of many years of a tumor in the pterygopalatine fossa. 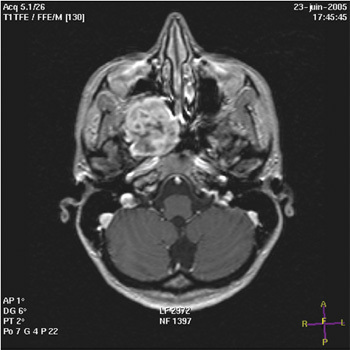 The tumor (5x 4.5 cm) extended to the sphenoid and maxillary sinuses, the nasal cavity, the skull base with an erosion of the cavernous sinus and the orbit with a close contact with the ophthalmic nerve. The patient had first refused to undergo the surgery because only an external approach through a paranasal and Caldwell-Luc incision had been proposed to her. 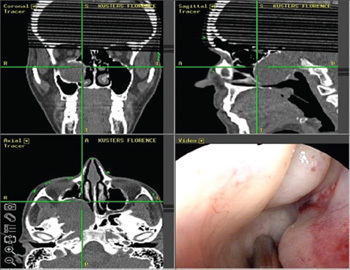 We proposed a strictly endoscopic surgery after embolisation that allowed the diagnosis and the complete removal of this extended trigeminal schwannoma. 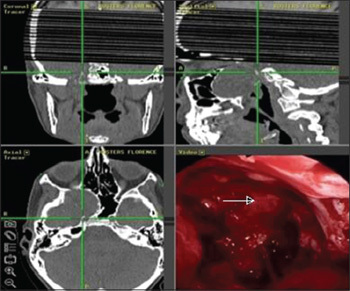 The computer-assisted endoscopic surgery allowed the preservation of the intracranial structures, the internal carotid artery and the ophthalmic nerve; the morbidity was minimal and the patient was totally free of pain after surgery. There was no recurrence of the tumor after a follow-up of 2 years. Intitution: Department of Otorhinolaryngology & Head and Neck Surgery, Erasme Hospital. Brussels, Belgium. Mail Address: Dr. R. Ghanooni - Department of Otorhinolaryngology & Head and Neck Surgery - Erasme Hospital - Route de Lennik 808, 1070 - Brussels - Belgium - Telephone: 003225554632 - Fax: 003225556826 - E-mail: rosemaryam_ghanooni@yahoo.fr. Article received November 15, 2008. Article approved May 27, 2009.